Our bumper June issue is packed with summery fun to inspire you to take to the waterways and make the most of the amazing weather we’ve enjoyed lately. Included in the 136-page issue is the chance to win tickets to Fairport’s Cropredy Convention, which will include a unique opportunity to see and hear iconic Sixties songstress Petula Clark making her UK festival debut at the age of 84! 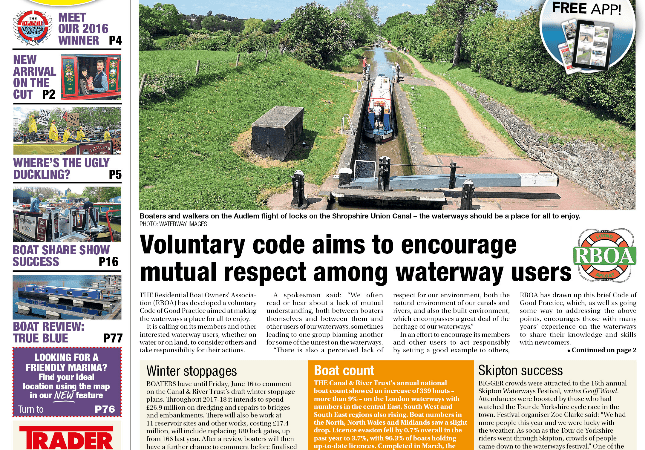 Other news items to catch your attention include the launch of a voluntary code of practice for canal users, a new arrival on the cut, the first wedding at Anderton Lift and a lottery grant for a historic steam launch. 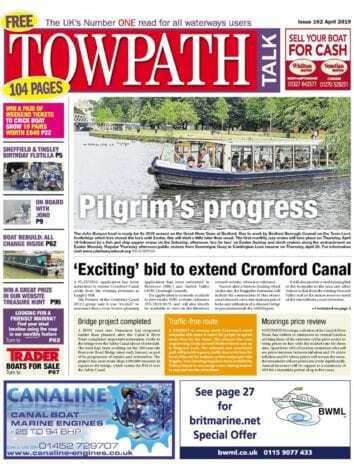 Event reports include the National Boat Share Show, Canalway Cavalcade, Ellesmere Easter Gathering and HNBC Rally. Find out who the winners were in our Volunteer of the Year awards and discover more about Driffield Canal and Thames waterways officer Tony Forster. 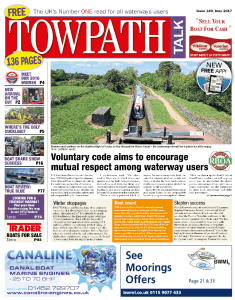 Our regular feature list is also packed with the latest information from across the waterways. Under the RYA spotlight this month are moves to tackle the litter problem; the IWA work party round-up; and in the community boating section we report on the Kennet & Avon trip boat anniversary, Rivertime regatta news and Wey & Arun’s crew appeal. Business news features prominently with the opening of the Harleyford Marina extension, shop plans at Barton Marina, a new managing director at ABC and Aqueduct Marina being awarded a work boats contract. Aintree Boats’ new build for an Everton fan offers a true blue review by Phil Pickin, and we go from something blue to lots of things new – stylish outdoor clothing and our latest book round-up. The What’s On section features a round-up of upcoming events including Leicester Riverside Festival, the Idle Women tour, Art at Dudley, Birmingham and Falkirk, Wey & Arun Poddle, Braunston Historic Rally preview and a host of June listings. The Holidays section contains a report from Drifters taster sessions and a new British Marine video, while Food & Drink focuses on the Perch Inn at Oxford, a brewery scheme for historic Stone Wharf, and the closure of a popular Nottingham pub. In the Technical section, River Canal Rescue looks at testing batteries and using a multi-meter, marine engine oil, a new moisture meter and there’s a feature on Slipway Services. On Scottish Waters – Hugh Dougherty’s bi-monthly round-up of events north of the border – includes a features on new lighting in the Falkirk Tunnel, the canal doctor and news of the launch of Lowland Canals Association, while Hugh also tracks down canal cops cycling the towpath. The regular Treasure feature looks at the International Slavery Museum and Helen Gazeley sounds out audio equipment in her latest Wet Web column. Cracker the chatty boat horse comments on the launch of the Montgomery Canal appeal and the annual triathlon, while NABO vice-chairman Mark Tizard brings news from the latest council meeting.